It’s one of the accepted realities of technology. If you buy something with a screen, from clocks to iPads, there’s going to be that little sheet of thin plastic film that covers the screen. Whether to protect it from scratches, protect it during shipping, or just to keep grubby fingerprints off of it, that little plastic film is everywhere. Except, starting now, in Apple stores. 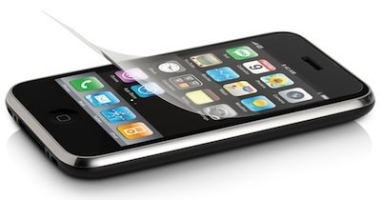 That’s right, Apple has banned plastic screen-coverings, both the thin static cling film and the hard plastic sort in some protective shells. The rumor bubbling up is that this is related to some sort of new touchscreen technology on Apple’s part, possibly multi-touch. It could be that, or it could be something as simple as new anti-scratch coating on screens or just a desire to make the display models of the iPod and iPad and iEverything Else look better. After all that film tends to look pretty ratty, even if it serves a crucial purpose.